No, that isn’t me. I can’t wear high heel shoes anymore. I’m too old to walk around in those things. I might fall out of them and break a hip. Everyone has a vice. My vice is shopping. It’s my therapy. Shopping helps me relax after a bad shift at the hospital. I’m sure that its therapeutic value has something to do with the serotonin receptors. 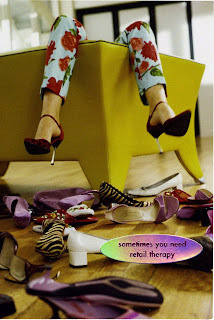 There are several schools of thought concerning retail therapy. My husband hates it. He cringes every time I have a bad shift at work because he knows what’s coming next. He told me once that I get a dazed look on my face before I head out for the mall. Macy’s, however, is a big proponent of retail therapy. It’s good for their bottom line. My local Macy's store loves it when I get stressed out at work. 1) The patient who asked me, “What would you do if I knocked you down on the floor as a ran out of the unit.” She asked this question as her big, brawny boyfriend was trying to get me to open the unit door. 2) The patient who told me that he was allergic to a mild pain medication after he swallowed the pill. The physician told me that the patient was manipulative, and that he was trying to get Oxycotin. I told the patient to get back to me when he started going into anaphylactic shock. 3) The borderline patient who stood at the nurses station for twelve straight hours, demanding to be released from the hospital. After all, she had the right to kill herself after leaving the hospital, right? 4) The two teenagers who started fighting in the hallway during visiting hours. 5) The mother who brought her child into the hospital after the kid bit her during a temper tantrum. The mother came up to the unit, looked at me and said, “Fix her.” I just shook my head and walked away. Oh Yes, Oh Yes......except I do thrift stores in search of the illusive high end items for the larger starving artist. Hub likes Tommy Bahama.....as do I, and Jones of New York or Ralphie fit very well, thank you. I pay less and have a lot more fun at less expense. Mr Shoptillyoudrop and Mrs. Shoptillyoudrop arrived lettered on identical sweatshirts this Christmas. I can spend quality time in a book store or a record store... but other than that I try never to go into any place that has a cash register. I don't like shopping that much, which is good considering I can't afford that type of therapy. My goodness, you sure do have an interesting bunch of characters that you take care of. Shopping is good... If I'm tight on cash, I even hit up the local thrift store because they sell brand new makeup for 99 cents!